FILIPINAYZD aka Irvin Sto. Tomas's comment reminded me of a long-overdue assignment for the Sangguniang Panlungsod -- our initial evaluation of the proposed merger between Naga City and neighboring towns Camaligan and Gainza. As a matter of strategy, notwithstanding the short-term costs, there are three reasons why it will make sense for the long term. One, it gives Naga a bigger population base of 190,678 as of last year’s census. This makes the city Bicol’s biggest in that respect, giving it an edge of more than 10,000 over Legazpi City. Two, a bigger population base puts it in a better position to influence the election of its congressional representative, especially if redistricting takes place. 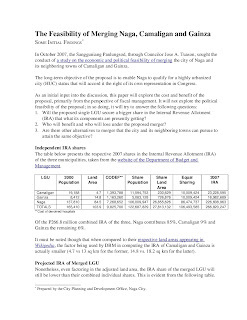 Finally, at a constant annual growth rate of 2%, the unified Naga will exceed the 250,000 population threshold by 2021 (instead of 2030, thus accelerating the process by 9 years), qualifying it for HUC status and its own congressman by the time election takes place the following year – assuming of course that current rules remain the same, and the proposed merger is approved by the electorate of Naga, Gainza and Camaligan in the first place. The proposed merger will usher in the shapes of things to come, like a METROPOLITAN NAGA DEVELOPMENT AUTHORITY. The sleeping giant is now awake. Camarines Sur, is destined to be the biggest metropolis in Bicolandia. As such , all the necessary infrastructures and support systems should be put into place to make it a model urban and eco-friendly City. The 3 -Billion peso gift of GMA to his son Dato, augurs well for the development of the area. Let's forget politics for awhile, because we need all the help we can get. El Ray's foray into International tourism will also put Camarines in the global radar of tourists that are looking for places off the beaten path. Let's just not make the same mistake Boracay made, OVERDEVELOPMENT, because of uncontrolled greed. It's in danger of sinking into the sea. Meanwhile, Albay has Its Misibis Resort for the dollar-heavy, and its Embarcadero Center at the Port of Legaspi ( ripoff of San Francisco's ?). But that's great, I can see great things for Bicol, and I can hardly wait to go home to retire. BTW, the price of Abaca has increased in the world market, can lightning strike twice ? remember Abaca put the Philippines in the world map, and Bicolanos were like the sugar barons of Negros in big-time spending and gracious living at the turn of the century. Will it happen again ?